Snappy, sweet and tangy. this week’s recipe using the Produce Geek‘s picks of the week brings a flavorful combination of shapes, colors and textures together on a single plate. 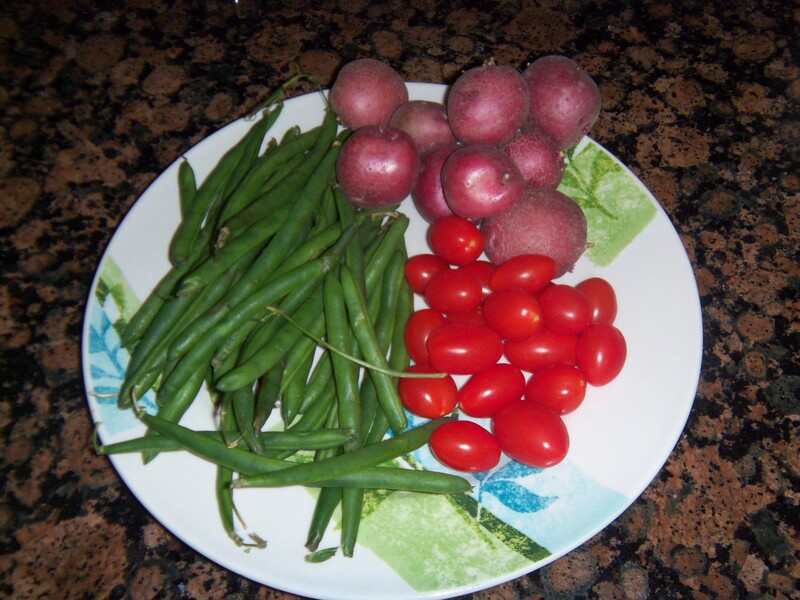 I was thrilled to find that green beans, red potatoes and cherry tomatoes made the cut this time around! All are fabulous veggies in their own right, but they’re even better when stir-fried in unison and seasoned with my Mediterranean-style sauce. I chose to also bring red kidney beans into the mix for a vegan-friendly protein boost. Vegetarian/vegan? Enjoy – this dish is 100% both. Prepare the stir-fry sauce: Whisk together olive oil, balsamic vinegar, apple juice, garlic, basil, sea salt & pepper into a small bowl and set aside. 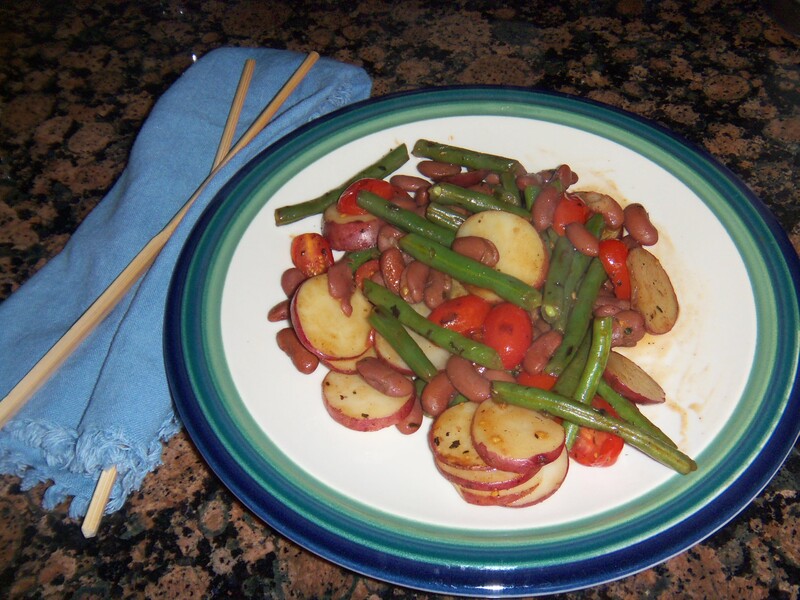 When the pan is hot, add red potatoes and green beans. Stir often until tender (to expedite cooking, you can use a lid or aluminum foil intermittently). Decrease heat to low and add tomatoes, kidney beans and sauce. “Hmmmm…” is what I initially said to myself as I reviewed the Produce Geek‘s buying advice this week. 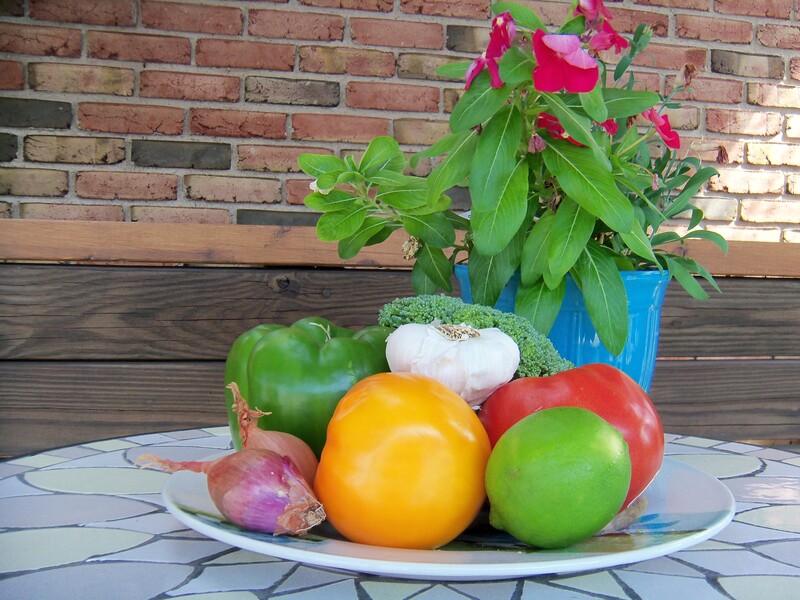 Some delicious produce, but not too much that I immediately recognized as ideal stir-fry or salad ingredients. BUT then the bolt of lightning hit! With red raspberries on the Produce Geek’s pick list this week, what could be better than a salad that features their summer flavor with hearty walnuts? “Nuts & Berries” – a perfect combination. 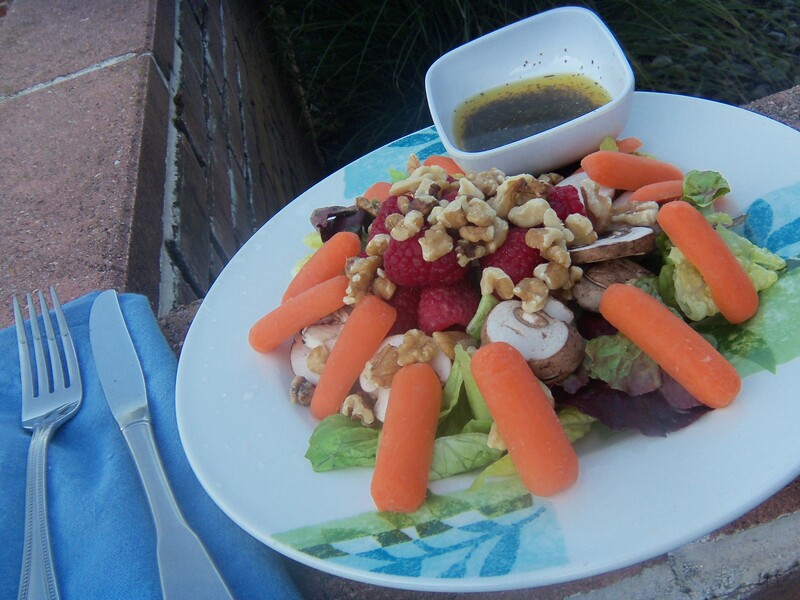 Placed on a bed of hearty lettuce with baby portabella mushrooms and surrounded by baby carrots (also among the Produce Geek’s recommendations), this salad is simple & simply divine with my Sweet Basil Vinaigrette Dressing. This salad is vegan, vegetarian & gluten-free. But that doesn’t mean that meat-eaters won’t love it, too! Top with baby portabella mushrooms in center. Add raspberries and walnuts on top of the mushrooms. Arrange baby carrots around the perimeter of the plate. Put all dressing ingredients into a medium bowl. Pour dressing into individual sauce cups or ramekins. 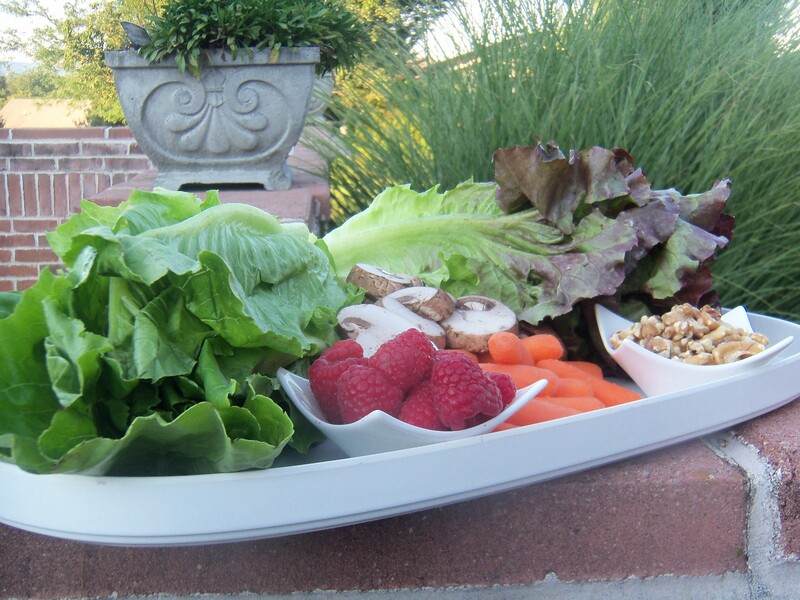 Serve up the salad & dressing and enjoy! 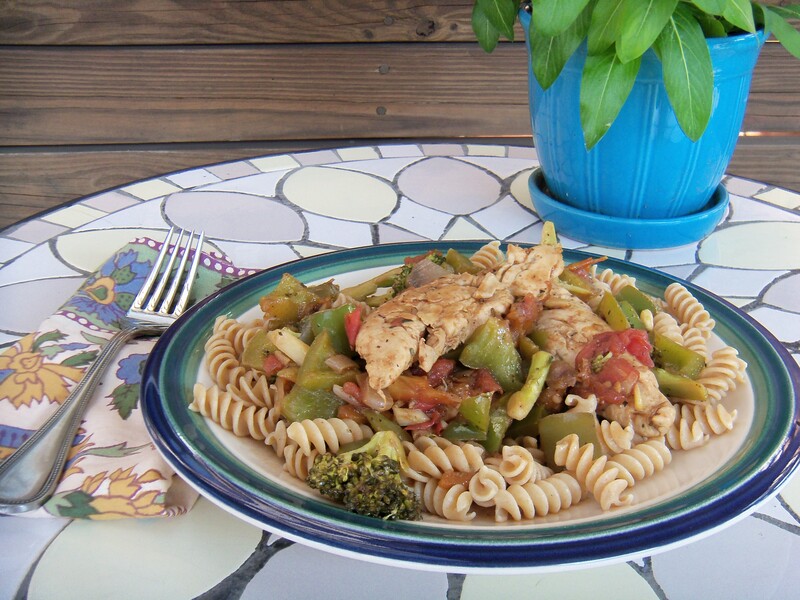 A perfect complement to whole grain pasta – or served all by its lonesome – this chicken stir-fry combines several of the Produce Geek’s weekly picks with olive oil, balsamic vinegar, basil & pine nuts to give it a delicious Mediterranean disposition. Even more perfetto with just a sprinkle of grated parmesan as the finishing touch. Vegetarian/vegan version: Substitute kidney beans for the chicken and (vegans) nix the idea of the parmesan. First, prepare the stir-fry sauce. Whisk together the 1/3 cup olive oil, balsamic vinegar, honey, basil, sea salt & pepper in a small bowl. Warm approx. 1 Tbsp of olive oil in an extra large deep frying pan or wok on medium heat. When hot, add garlic & shallots until they start to brown. Add chicken tenderloins and stir until cooked thoroughly. Remove ingredients from the pan/wok, set aside and keep warm. Add another 1 Tbsp of olive oil to the pan/wok and add green pepper, broccoli & tomatoes. On medium heat, stir until green pepper and broccoli start to turn tender (approximately 10 minutes). Add the stir-fry sauce, chicken/garlic/shallots, & pine nuts. Squeeze 1/2 lime into the pan/wok and stir until all ingredients are evenly distributed. Serve over pasta with grated parmesan cheese on the side. Makes 4 servings – Buon Appetito!